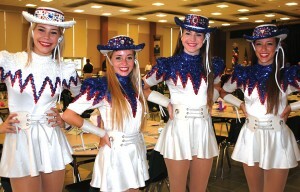 Clear Lake High Flairs Emily Akins, Colbie Bowker, Rachel Ellison and Brooke Beeson, from left, prepare to perform for the crowd at the League City Chamber’s annual Kickoff By the Creek at Clear Falls High. Nearly 40,000 Clear Creek ISD students returned to school this fall to find some of their campuses had under gone major repairs. In all, CCISD spent $6.4 million as maintenance and facility services employees worked hard all summer replacing aging equipment and making repairs. “We must ensure our schools are safe and effective learning environments for students,” explained Superintendent of Schools Dr. Greg Smith. Clear Springs High cheerleaders greet the arriving crowd at the League City Chamber’s annual Kickoff By the Creek luncheon, held in the giant cafeteria that serves all three Education Village campuses. CCISD Maintenance and Operations tackled projects at all 43 schools totaling $2,455,600, Assistant Communications Director Janice Scott said. Serving lines were replaced at 14 elementary schools at a total cost of $933,380, she said. Schools where the serving line was replaced are Armand Bayou, Bay, Brookwood, Clear Lake City, Ferguson, Greene, Hall, Landolt, League City, Ross, Ward, Wedgewood, Whitcomb and White. The Clear Lake High School walk-in freezer was replaced because foundation issues had damaged the original unit beyond repair. Total cost of this project was $128,556.